This week commenced the annual ski break week in Southern Finland (Helsinki metro area). Finland rotates this ski week with the rest of the country so that everyone doesn't go on break at the same time. While it traditionally is time to get away and hit the slopes, it seems that many Finnish families enjoy this week by seeking out sun in order to escape the winter doldrums. It becomes a mix of families heading up north to Lapland to hit the downhill ski resorts and some flying off to the Canary Islands or Thailand to soak in some sun. 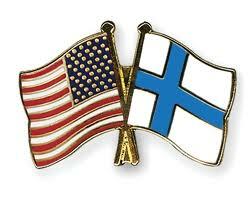 What most people in the US don't probably know is that Finland is not a downhill skiing paradise. Just because it snows here for a solid 3-4 months, doesn't mean that the country is loaded with chairlifts and ski resorts. Actually most of the substantial downhill ski areas are in Lapland to the north and they are not very convenient to reach via car. One must drive 7-10 hours north to get to Lapland where most of the resorts reside, so most Finnish families end up flying. Finland is definitely more of a cross-country skiers wonderland as there are copious amounts of trails for this in just about every city. For many Finns it seems that cross country skiing is exercise to replace walking in the winter. Our family enjoyed 2 consecutive days at a designated cross country ski area in Helsinki called Paloheinä. This place featured many kilometers of cross country skiing in very diverse terrain. There was a mix of fields, forests and some kiddie practice tracks. The coolest thing about this ski area was the huge sledding hill. This sledding hill was long and wide and resembled a small downhill ski run minus any major bumps. Daring kids were whizzing down this gargantuan hill at breakneck speed, seemingly immune to any danger. My son and daughter went tandem most of the time and avoided collisions with the other sledders. They are slowly getting their confidence up on these sledding hills, while it seems that the Finnish kids have courage in their DNA makeup. This week Finland also just celebrated a quirky little Holiday called Laskiaispulla paiva or Shrovetide cake day. 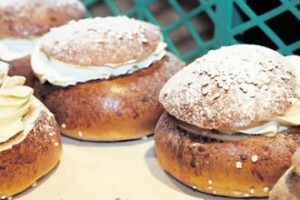 Laskiaispulla is a cardamon spiced wheat bun that has it's top cut off and the insides scooped out, and the resulting space filled with a mix of the scooped-out bread crumbs, milk and almond paste, topped with whipped cream. The practice of Shrovetide, or Shrove Tuesday was originally a Catholic tradition known for eating pancakes and other sweet things before the start of Lent. In Finland and other Nordic countries the feast day was strictly held on Tuesday, but the Protestants relaxed the tradition and Sunday became the traditional day for the feast. I tried a few of these tasty treats freshly baked right out of the oven. Very nice, you should try pulla when visiting Finland! I tried these for the first time this winter, too. There are too many delicious cakes and pastries in the wintertime here. I had just finished working off the calories from all the runebergintorttuja!